An opportunity for giving that provides lasting benefits to St. Luke’s Lutheran Church. St. Luke’s Foundation is a permanent Endowment Fund established in 1998 as a qualifying charitable tax- exempt 501(C)(3) organization. It is a nonprofit entity with its own Board of Directors elected from the members of St. Luke’s Lutheran Church. St. Luke’s Pastor serves as an ex-officio member of the Board. Fund assets are professionally managed. Gifts and memorials received are invested in the Endowment Fund. Gifts may be immediate (cash, stocks, bonds, mutual funds) or deferred (planned as part of a will, trust, or estate). Income generated from the Fund is used to finance special projects and ministries not included within the annual church budget. Gifts to the Foundation are a thoughtful way to honor special occasions or special people in our lives. Click here to donate to St. Luke’s Foundation. You will have the opportunity to give your donation in honor or memory of a loved one or special event. Tellers works in pairs, rotating weeks. The tellers process the offering collections. They separate the yellow welcome cards, count the money, and prepare the weekly bank deposit. Their work ensures members’ donations are properly recorded and money is deposited into the bank in a timely fashion. Consider joining St. Luke’s Care Team Ministry! ​St. Luke’s Care Team members have a passion for serving others and devote their time to making sure our homebound, sick, or members going through a crisis know their church is here to help and listen to them. Members of this ministry make phone calls and visit, and distribute communion to those who are unable to attend church. Contact is made once a month, every other month, or whatever works best for the person. The smiles and hugs received from these members is the most wonderful part of this ministry and tells the story of how important it is to keep everyone connected to St. Luke’s no matter what their circumstance. In 2017, the team made over 100 contacts/visits. Currently there are ten members on the team, but we are always open to adding more. There are a variety of ways to share your tithes and offerings: the offering plates passed during worship, Simply Giving where your gift is withdrawn electronically from your bank account, as well as the Giving Kiosk that is locate right of the main entrance as you depart. Questions on how to participate in Simply Giving can be answered by the Minister of Finance, Heather Kambeitz, or a Stewardship Team Member. The favorite annual event of the stewardship team is the Heritage Days Parade. Being generous to the community one bag of fruit snacks at a time symbolizes the blessings that God gives us. At St. Luke’s we pass these blessings down through the generations. Several families have three generations dedicated to the church and the community. 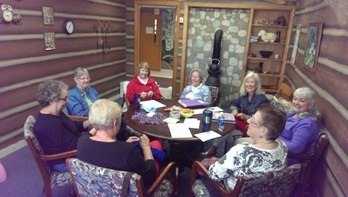 Knitting Ministry offers physical warmth along with prayer support and compassion to all in need. The ministry began in 2002 as a Prayer Shawl Ministry with Joan Johnson as leader. Since 2010 we have expanded to making hats, scarves and mittens. Winter gear is donated to several schools and charities in the Bloomington area and one rural school. Information about the need at this school was expressed to Judy Nielson and we were privileged to help. Many of these children ride the school bus for over an hour each way to school in northern Minnesota and live in a very limited income area. Prayer shawls are given to those suffering in any way, be it loss, illness, or bereavement. Many emotional and grateful notes are sent for the physical warmth and comfort provided as well as the spiritual comfort of prayer knit and crocheted into each item. No experience is necessary. Come, learn, and enjoy giving to others. St. Luke's has been volunteering for Loaves and Fishes since 1984. Currently we are serving a meal once a month, on the third Wednesday, at Hope Presbyterian Church in Richfield. The Loaves and Fishes crew consists of cooks, set-up people, servers and a clean-up crew. This ministry is a great way to get to know other members of the church and do something good for the community. If you would be interested in joining this ministry or would like more information, contact Andy Hayden at andyhayden@musician.org or Danielle Forsman at bpaulz123@yahoo.com. ​In 2017 St. Luke’s assisted in packing 1068 boxes, 227,896 meals and fed 622 children for a year at Feed My Starving Children. We provide an opportunity monthly to assist in making a difference at Feed My Starving Children. in our church and the Communities, both local and global. 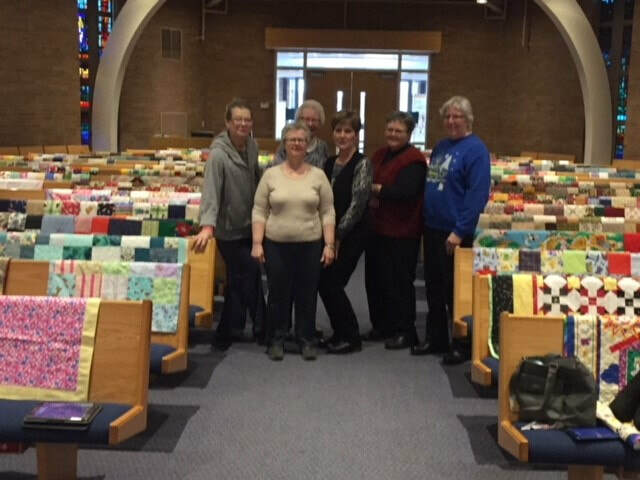 Quilting Ministry started making quilts for people in need in 1998 and continue to get together twice a month to tie quilts while enjoying the fellowship and support of one another. We welcome donations of fabric, thread, unfinished quilts and batting to continue our ministry to others. Donations have been to Lutheran World Relief, Crisis Nursery, Iraqi orphans, Katrina victims, St. Joseph Home for Children, Mary's Place, and several other places. One story that made a difference was Pastor Karen's visit to Tanzania. She saw one of the quilts from LWR in a hut that was treasured by the family. It's a wonderful feeling to know that our quilts are cherished by the people who receive them. There is talk about a class with the kids this summer, teaching them to make quilts. All ages welcome.